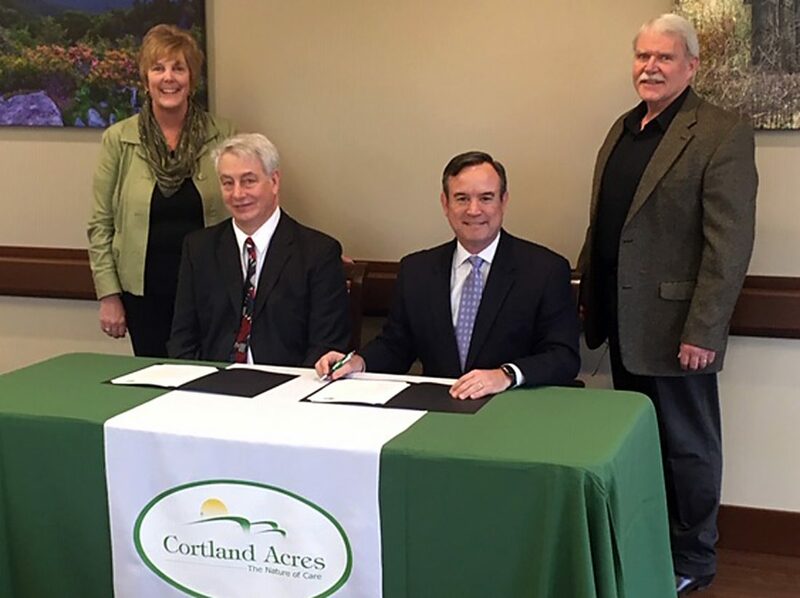 Submitted photos Cortland Acres President Pat Nichols and Executive Vice President of Western Pocahontas Properties Kevin Craig sign a joint statement endorsing Cortland’s Vision 2030. 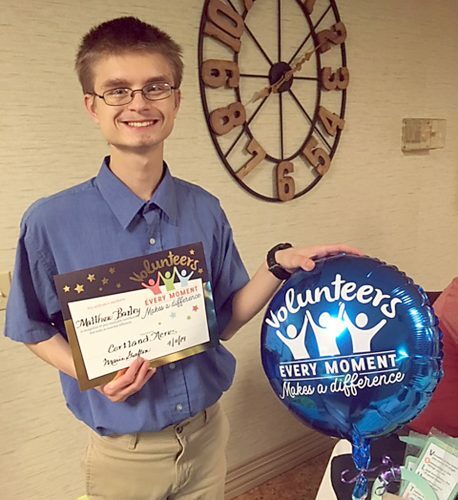 THOMAS — A monumental event for Tucker County and the region took place on Wednesday, February 6, 2019. 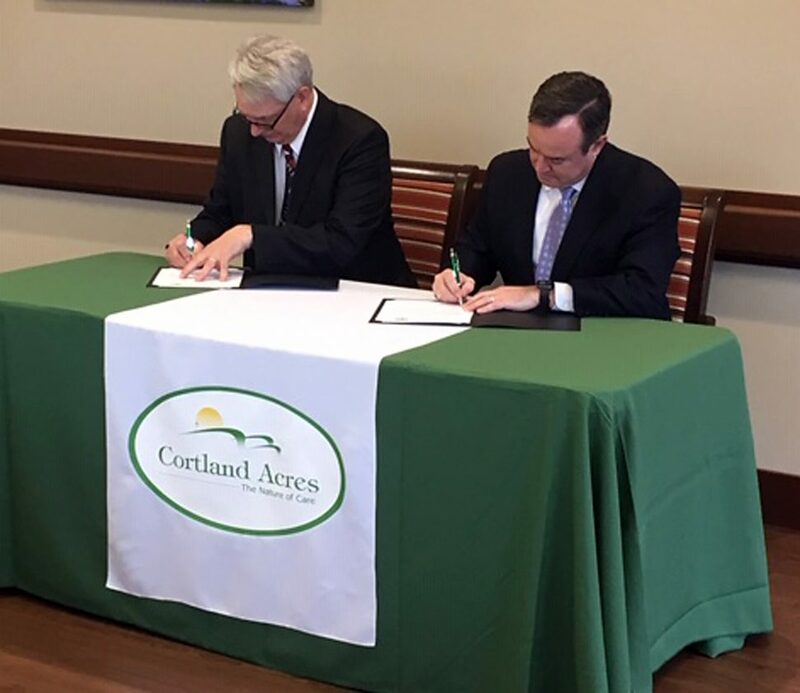 In a signing ceremony at Cortland Acres, Western Pocahontas Properties publicly expressed its support for Cortland’s Vision 2030. As the largest private landowner in Tucker County and owner of all the property contiguous to Cortland’s existing campus, Western Pocahontas Properties plays a critical role in the fulfilment of Cortland’s Vision 2030. Acquiring as much as one hundred acres or more within Western Pocahontas Properties land portfolio may be necessary in order for Cortland to accomplish the initiatives adopted by its Board of Directors. Kevin Craig, executive vice president, Coal for Western Pocahontas Properties, offers his company’s endorsement of Vision 2030. “We have seen the growth of Cortland over the years and have taken a close look at Vision 2030. As a company we are delighted to participate in and support such a progressive and innovative agenda. As a major land owner in the United States, we understand the need to strategically plan for the future. The energy market as well as health care continues to experience radical change.” Craig knows both fields quite well. He serves on the West Virginia University Health System Board of Directors and is also a former State Legislator. Cortland Acres President Pat Nichols described the important role of Western Pocahontas Properties in Cortland’s history and in the fulfillment of Vision 2030. Cortland Board members show support of the joint statement of endorsement between Western Pocahontas Properties and Cortland Acres Association, Inc. From left, board members Mark Teets, Dewey Rice, Milan Nypl, Pat Nichols, Jarolyn Phillips, Executive Vice President of Western Pocahontas Properties Keven Craig and Cortland Board member Mary Sagace. Key features of Vision 2030 include: the creation of small, self-contained skilled-care homes to dramatically increase the satisfaction of long term nursing home residents; a health complex which hosts medical specialties to collaborate with state and nationally recognized health systems; expanded independent retirement home options with a variety of floorplans and amenities available; an “age friendly” community through services and programs that provide mutual benefit to the very young and not so young; conservation and wellness exemplified in a 5-acre solar farm, an extensive walking trail system and orchards scattered throughout campus; a strengthened and expanded workforce by providing employees the opportunity to secure home ownership in an employee residential community; a large event center bringing a variety of entertaining, social and educational events to the community, as well as serving as a Red Cross approved shelter during natural disasters. If you would like to know more about Cortland Acres and Vision 2030, call Cortland Acres at 304-463-4181. The Cortland campus includes a 94-bed long-term care facility, inpatient and outpatient rehabilitation and therapy options, as well as a variety of independent living opportunities. For more information call 304-463-4181 or visit www.cortlandacres.org.